LG announced this evening that its 5.5-inch Quad HD LCD panel for smartphones has been approved and will be unveiled with their forthcoming flagship smartphone. They are talking about the LG G3, which will be announced on May 27 across the globe. The panel goes into mass production shortly, is ultra slim at 1.2mm thick, and only has a 1.15mm bezel. For comparison, last year’s LG G2, which had a minimal amount of bezel, weighed in at 2.3mm. 1.15mm is insanely thin. Seoul, Korea (May 8, 2014) – LG Display announced today that its 5.5-inch Quad HD (QHD) AH-IPS LCD panel for smartphones was certified as a QHD display after passing verified tests by NEMKO, the Norway-based international testing and certification organization for electrical products. The certification comes shortly before the new Quad HD LCD panel will be unveiled with the forthcoming LG’s flagship smartphone to be launched in the first half of the year. The certified 5.5-inch QHD AH-IPS LCD panel has 2560 x 1440 pixels, four times the image resolution of HD panels and 1.8 times higher resolution than a Full HD panel. With 538 pixels per inch, this panel also meets the 100 percent RGB color reproduction standard. This panel, which will go into mass production shortly, will offer superior performance to other existing smartphone panels. This is an ultra-slim panel with a mere 1.2 mm thickness and has a 1.15 mm bezel, which will be the narrowest available and 0.05 mm less than panels introduced last year. In addition, the panel has achieved the same level of brightness as a Full HD panel. It is difficult to raise penetration ratio in higher resolution panels since they have more pixels. However, LG Display successfully achieved higher brightness by improving the penetration ratio through enhancing the pixel structure design and aperture ratio in the LTPS backplane. The Quad HD display produces images in sharper color and contrast than regular displays because of the greater amount of pixels. This means that high resolution images and videos in the Blu-ray format can be viewed in a fully vivid and realistic manner. The display retains the readability of letters and images without distorting them when they are enlarged while surfing the internet or working on documents. 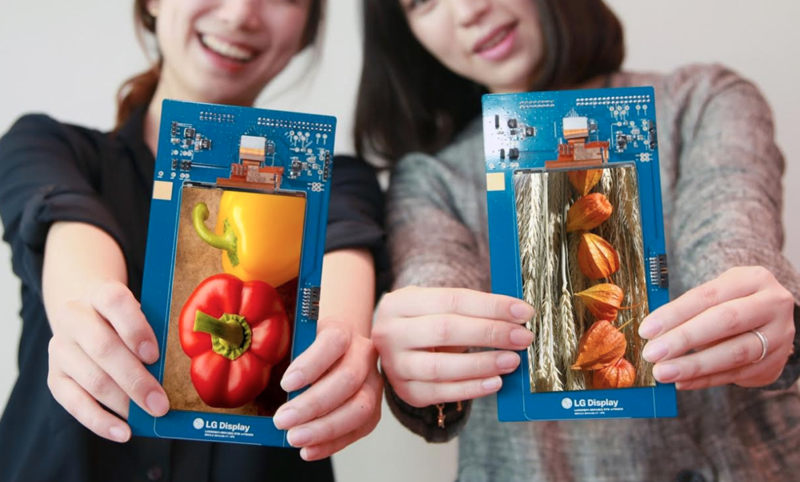 According to DisplaySearch, the shipment of premium smartphone displays based on LTPS backplanes is expected to grow to 780 million units by this year and 940 million units by next year. These products are going to maintain sufficient competitive advantage in premium product categories where large size, high resolution and low power consumption are key factors.